Tis’ the season to be jolly and there’s no better way to celebrate the festive holidays than in a cosy cottage. With a little imagination, you can create a memorable Christmas and New Year getaway your guests will love. By implementing the ideas below, you may earn yourself a five-star review, a few referrals, or even persuade your visitors to come back again for next year’s festivities. The holidays are known for relishing tasty treats and beverages which evoke the feelings of cosiness and nostalgia. Surprise your guests upon arrival with an extra special Christmas welcome pack filled with festive goodies. Leaving a Christmas card for your guests is a nice personal touch that’ll leave them feeling really welcome. Reindeer dust for the children to sprinkle – and a carrot of course! Invest in some decorations for your holiday cottage to leave a lasting impression on your guests. Christmas tree: In addition to one in the main living area, why not get a few smaller trees that can be placed around the house for added cheer. Decorating the Christmas tree is a tradition all the family can enjoy, but maybe your guests didn’t get a tree at home in anticipation of being away for the holidays? Leave a bare tree, ornaments and lights in your living room, so they can decorate it as a family – creating lasting memories. Wreath: A pretty wreath of holly, mistletoe and other festive foliage on the front door is another easy way to welcome your guests as they arrive. Fairy Lights: Fairy lights makes for a cosy atmosphere. Tableware: Include table coverings, napkins and crackers. 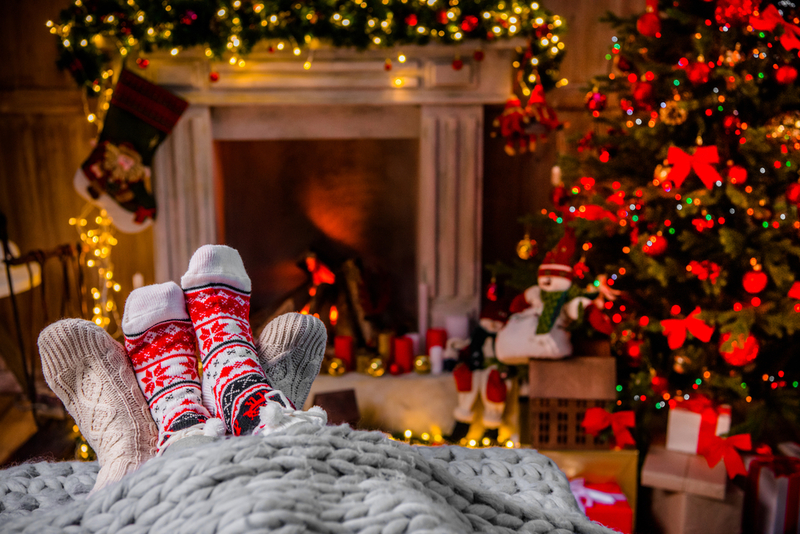 Stockings: Whether hung on the mantelpiece or by the tree, Christmas stockings are a lovely touch for families spending Christmas day in your cottage. With all the Christmas chaos, it’s likely your guests will have left the planning to the last minute. Make their lives easier by creating a ‘what’s on guide’ so they can have a memorable stay (this will also make a useful blog post). Where to enjoy a walk on a crisp and sunny winter morning. The best pubs with cosy fires. The best Christmas light switch-ons and markets featuring local produce and a warm welcome. Make a list of your favourite local shops for some last minute gifts. Try and negotiate an exclusive discount just for your renters. The best place to celebrate New Year’s Eve. Recommend somewhere they should book for their Christmas Day meal. To help ensure their holiday gets off to the perfect start, try to minimise travel stress. Be flexible with your arrival/departure days. Avoid peak dates such as Christmas Eve, Boxing Day and New Year’s Eve, so guests can avoid congestion on the roads. At this time of year there’s an increase in adverse weather. If there are travel warnings in place, contact your guests so they know the local weather conditions and if there are any problems reaching your property. Work together to resolve the situation safely. Let guests know when you are available to help with any questions or emergencies over Christmas – but make sure you enjoy your Christmas break just as much as your guests! I can’t stress enough how much guests appreciate these thoughtful little gestures and personal touches. They make all the difference and show guests that your care about their Christmas holiday.